After two hours of raking leaves in chilly weather, I had the most delicious dinner since the beginning of November. (On 1 November. Still though, it was amazing.) 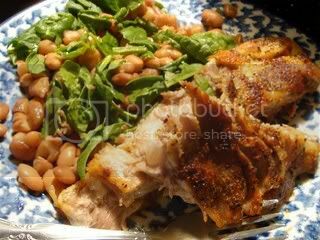 It was a plateful of pork ribs cooked in the oven and wonderfully tender pinto beans mixed with spinach and pork broth. This was the most saltiest goodness ever! Besides being really salty (something which the heat offset), it reminded me of menudo broth. I haven't had any for quite a while and that's probably why I kept slurping it by the spoonfuls (well-made menudo isn't as salty as this was, though). 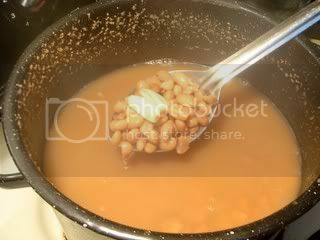 I've found out from Mexican restaurants that the best pinto beans have a pale brown hue, the result of the beans constantly having adequate water during the entire cooking time (add boiling water so the temperature doesn't drop). I can't quite recall the flavors of the seasonings used to coat the pork (I didn't cook it, which is probably why), but the result was tender, juicy meat. It was really buttery in the sense that it "dissolved" in my mouth instead of lingering like dry strands of stringy sawdust sticks. I added some spinach to my beans for color and the obvious nutritional aspect, then I poured a little of the aforementioned pan juice on top to give it a better flavor. lol, that's a good way to describe the fat floating on top. The pork look wonderful. How long did you cook it for in the oven? I like the way your end product looks on the plate. Hmmm... I can imagine that lukewarm broth wouldn't taste too good. ;-) Thanks for stopping by my blog. 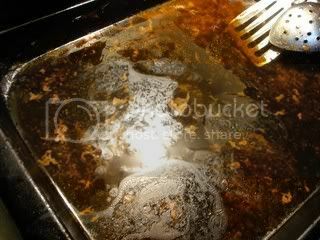 Valerie - Some water was put in the roasting pan, then the spareribs were roasted at 300˚ for about 1 hour and 45 minutes. Then the spareribs were removed from the first pan and placed on a baking sheet to crisp the skin, 425˚ until it crisps up, though you can use the broiler. 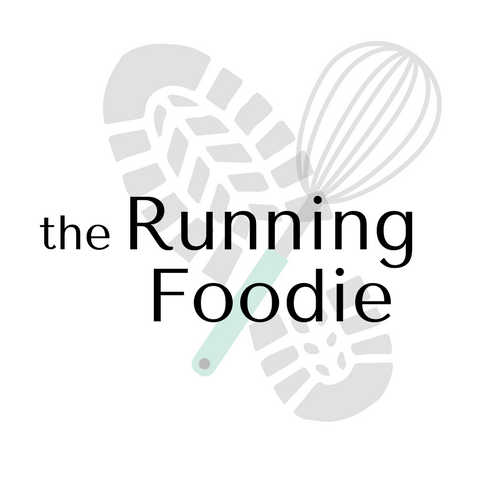 Paz - No problem, I like reading other foodie blogs!